If you’ve said any of these sentences, it means you haven’t found proper hair care yet (just like most women). Every woman knows from experience that it isn’t easy. Each of us is different and has different needs when it comes to hair care. Most companies selling hair products seem to ignore this fact. In the meantime, the choice of proper care should start with determining the most important criterion: what (and why) our hair likes. Hair porosity is this kind of criterion. It characterizes the condition and appearance of our hairdo. You will check if your hair is healthy or very damaged by identifying hair porosity. It isn’t hard to do because shape and looks of our hair often allow us to properly determine its porosity. Hair porosity – why is it so crucial? Hair porosity – in simple terms – is determined by the size of the gaps between hair stem and hair cuticles. Damaged hair has highly raised cuticle scales (called high porosity hair). Low porosity hair has cuticles that cling to hair stem. This hair type looks healthy, thick and it actually resists damage or dehydration yet it is very easy to weigh such hair down or disturb the scalp. Porosity affects the way our hairdo looks like as well as how hair reacts to hair care. Stressed hair with raised cuticles need different substances than low porosity hair with closed cuticles. Nanoil hair oil – why is it the best? Nanoil hair oil satisfies the needs of hair of all porosities. It is an innovative product available in 3 versions. Each of them is suitable for different hair type. The list of ingredients comprises appropriately matched natural oils that have been successfully used for hair repair and protection for ages. Natural oils are made of different sizes of particles, therefore they are ideally matched to the condition of hair cuticles. That is why, Nanoil hair oil has the best balance of oils that suit all types of porosity. You’ll be pleasantly surprised by the quantity of oils included in each version. Apart from precious oils abounding in saturated and unsaturated fatty acids, Nanoil hair oil contains innovative, natural ingredients that protect, beautify and fix damage on hair surface as well as contribute to faster hair growth and volume boost(unique kerastim and baicapil complex stimulate hair bulbs, therefore if we oil hair and scalp regularly, we can enjoy the growth of new hair, so called baby hair). How does each version of Nanoil hair oil look like? You must match Nanoil hair oil to your hair type. It isn’t complicated. Usually, all you have to do is take a closer look at your hairdo. ♥ Thick, stiff, lacking volume, greasy hair: choose Nanoil for low porosity hair. It will facilitate styling, shield from damage, gently lift the roots, enhance volume, improve hair looks by delivering softness. 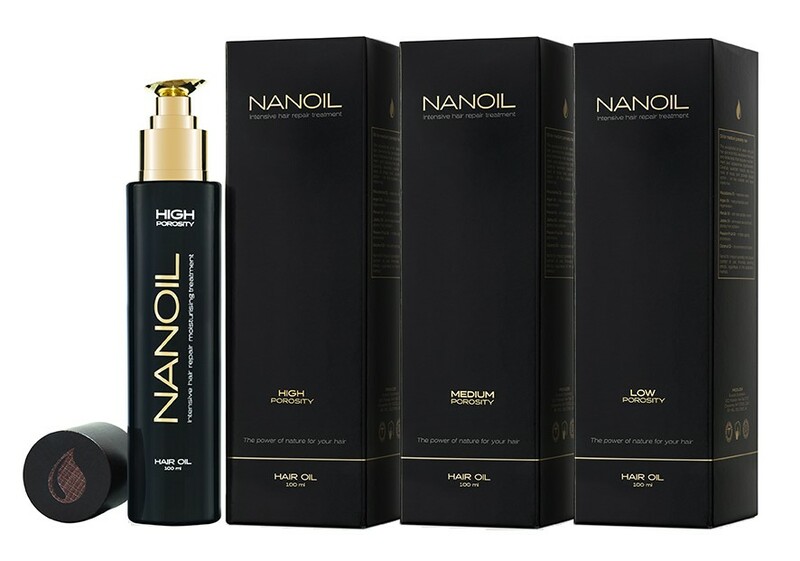 Thanks to Nanoil hair oil, your hair will become thicker, grow more quickly whereas the scalp will be no longer greasy. ♥ Medium volume and thickness, tends to dehydrate (especially hair ends), excessive frizz, often gets dull, starts falling out: choose Nanoil for medium porosity hair. This version of Nanoil contains as many as six high-quality natural oils and complex of conditioning ingredients(silk and vitamins A and E) and substances that stimulate hair growth and increase volume (kerastim and baicapil). Nanoil hair oil immediately beautifies by boosting shine and bounce. It ensures proper level of moisture, makes styling easier, repairs, strengthens and protects hair from roots to tips. Regular scalp oiling with Nanoil will leave the scalp clean and healthy. It will also reinforce hair bulbs and enhance their work. ♥ Extremely dehydrated hair, damaged because of colouring and bleaching, brittle, fragile, shine-less: choose Nanoil for high porosity hair. Nanoil for damaged (high porosity) hair delivers complex care, strength and repair. Nanoil will rebuild keratin structure of hair and restore vitality and health. Nanoil for high porosity hair consists of six highly-rated exotic oils. Their particles perfectly fit between raised cuticle scales. One of the unquestioned assets of Nanoil is the fact that each of the three versions can be used in a variety of ways, depending on what our hair needs. The oil will work as a rebuilding and deeply repairing hair elixir as well as beautifying and shine-boosting serum. It will help you to tame and style a hairdo, protect from frizz and heat styling. The oil contains sunscreen so the sunlight won’t be a problem. Each version can be also used as serum for split hair ends, rinse-out or leave-in conditioner, an addition to your favourite hair mask. Endless application methods – luxury that no other hair conditioner can offer. Nanoil is a must-have in your bathroom!